 Psychoanalyst Strozier (History/John Jay College/CUNY; Lincoln's Quest for Union--not reviewed) probes the minds of ``end- time believers'' to investigate a growing religious trend that he sees as one response to a widespread sense of ultimate threat. Over one quarter of the American people believe that God will cleanse the earth in a fiery destruction, send Jesus back to rule for 1,000 years, give the saints victory over death, and cast everyone else forever into a lake of fire. Strozier bases his study on five years as a participant/observer at four New York City churches and on interviews with church members. He finds that fundamentalist discourse is permeated with images of violence and circles around the problems of guilt and shame. Strozier takes care not to caricature his informants or to treat their beliefs as pathological. In some cases, he sees them as leading towards a greater engagement with life, e.g., the Reverend Charles and his Harlem congregation, for whom the apocalyptic vision is an urgent call to greater awareness and social action. Typically, however, he notes a profound split separating believers from an ever more rotten world, and their own sinful past from their present perceived purity. Human beings can bring nothing to their redemption, according to this view, and there is a dissociative shift in agency toward an angry God who dooms sinners to a genocidal cleansing. Strozier offers some penetrating insights along the way, but many readers will find it odd that a study of American religiosity is confined to New York City. 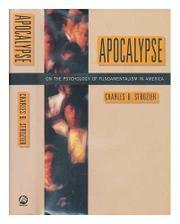 In his historical survey, Strozier does not refer to the apocalyptic excesses of some early Puritan groups, and he makes no attempt to show how apocalyptic beliefs stand in relation to traditional Christian doctrine and what this might imply psychologically. Nor does he address the obvious question: Why are such ideas more popular in this country than elsewhere? A timely study that, as the author says, offers more interesting questions than simple answers.